In which Major Thomas Carruthers asks for the aid of The Black Diamonds in solving a most puzzling mystery unfolding at his country mansion: the resolution of which has repercussions beyond comprehension. 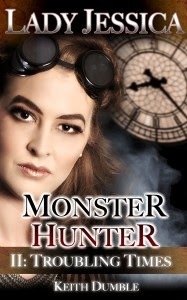 And The Black Diamond's adventures continue in episode 2 of Keith Dumble's Steampunk serial, LADY JESSICA: MONSTER HUNTER [TROUBLING TIMES]. Very steampunk with it's long-ish title, eh. Episode 1, Heart of the Empire, dealt with vampires, episode 2's theme is about time travel and a garish future destroyed by dragons thanks to man's greedy nature. Yup, dragons! As always, I can't give you a good plot summary else I give so much of it away. Let me just reassure you that KDumble is relentless in giving us heaping servings of action. There's not a dull moment in Lady Jessica & Co.'s life it seems as each action sequence is immediately followed by a revelation and these two devices would alternate in this 80-paged serial. Quite the pace which I love because nothing beats a good read than a quick read. The world building is wonderful even if the setting is centric on Lady Jessica's mission and whereabouts. KDumble would slip pieces here and there to give us a glimpse of his Empire and so far I'm loving it. There's gadgets are in abundance and science plays a big part in his world. 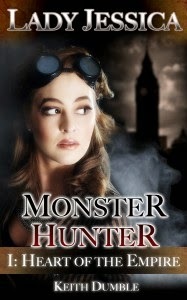 There's not much of a paranormal vibe, LADY JESSICA: MONSTER HUNTER [TROUBLING TIMES] leans more on the sci-fi adventure but it's not riddled with too much jargon that it becomes too highfalutin and boring. So why give LADY JESSICA: MONSTER HUNTER [TROUBLING TIMES] only 3 cauldrons? Well I'm still waiting to see/meet the other side of Lady Jessica. At this point, I know her facets as a leader and soldier but I'd like to meet the woman, see her human side and that part of her that craves the adventure and daredevil acts. There's not much character development at this point but from how things ended in episode 2, I'm hoping that episode 3 will satisfy my wants and make Lady Jessica a completely fleshed out character. I love this Sunday tradition you have b/c I keep seeing new to me Steampunk stories and series. This one sounds like it has potential. Sounds like Lady Jessica has potential too and I hope she comes through for you in book three. No prob! I get the shelf cleaning goal. Congrats for getting it done! Fab review Braine... It sounds like a great read and I can understand the 3 cauldrons, when you are eager to see the full picture. I hope I see it in the last episode! Oh I hope lady's Jessica will change a little bit because it sounds good if not for her. Thanks for the review. I hope so too, thanks for stopping by! I almost missed this. I do love your Steampunk Sundays. This sounds pretty good, I might hold off until I see your thoughts on the third book!